Unai Emery has implored his players to learn to maintain their calm in tense situations after what Mesut Ozil did during Arsenal's last Premier League match. The Gunners suffered a 1-0 loss when they visited Goodison Park on Sunday, no thanks to a 10th-minute close-range tap in from Phil Jagielka. It was a lost opportunity to move back to third spot and make stronger their hopes for Champions League qualification for next season. 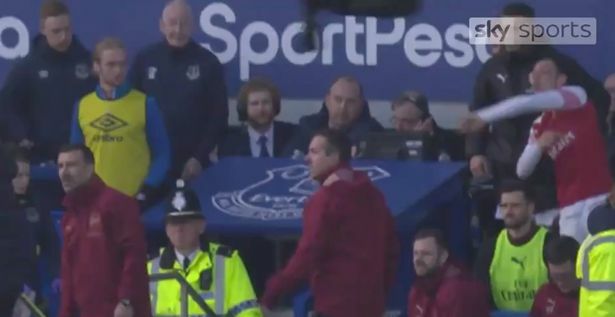 Minutes to the end of regular time, there arose an altercation between Unai Emery and Everton boss Marcus Silva. The duo argued over Shkodran Mustafi's foul on Dominic Calvert-Lewin and it was in the process that the assist king appeared to have thrown his jacket at the opposition coaching staff. This prompted the Spaniard to issue a rallying cry to warn his side against losing their temper when similar occurrences show up in the future. "We need to limit our frustration and we are learning that," said Emery after the match. "[It was] not a good result but we are in a good way, we are fourth in the table." Chelsea's win over West Ham United tonight has dropped Arsenal to fifth on the table - a point behind Tottenham Hotspur and three less than the Blues who have played a game more. They will host Napoli in the first leg of the Europa League quarter-finals then return to the league for action against Watford four days later. There are chances that Laurent Koscielny and Granit Xhaka will miss their third consecutive games as a result of injuries.